The Most Difficult Arcade Games – Ever! Arcade games, or Coin-Ops were designed to punish you, and be insanely brutal. These games were designed like this for the sole purpose of eating as many of your precious coins as possible. While all Arcade games bear this mark, some of the games were exceptionally or unreasonably hard; making them virtually impossible. Here we’re going to chronicle the most heinously impossible Arcade Games of all time. That way we can all re-live the crippling shame and defeat that we experienced when we first played these games. Originally released in 1982 by Williams, Sinistar is a legendarily difficult game. The concept of the game shares some similarities with Asteroids in setup. 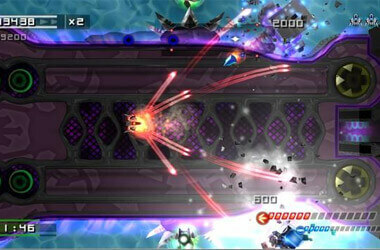 The game is a field shooter set in space, and the player is tasked with mining the asteroids. The similarities end there however, as you’ll soon find yourself facing tons of angry spaceships trying to turn your mining mission into an invitation to your own funeral. In addition to the numerous enemies flying around trying to utterly destroy you, at the start of each level the game begins building it’s namesake enemy: The Sinistar. The Sinistar is basically a giant spaceship made to look like a demonic skull, and he is not fooling around. Once completed, Sinistar will chase you around space all the while saying things like “Beware” and “I hunger”. So just how do you defeat the Sinistar? Mining the asteroids happens to release crystals that your ship then uses to construct Sinibombs. You will then use these Sinibombs to destroy The Sinistar. Sounds simple enough right? Well when you factor in the fact that every single thing onscreen is trying to kill you and moves much more rapidly than you, you can begin to understand how this game earned a reputation for being impossibly difficult. There might be more to it than that though. Legend has it that Williams wanted the average play to last around 2 minutes; thus the difficulty was ramped up to shorten the play time. The programming team has been quoted as saying that the original playtime of the game was closer to around 3 minutes before Williams had them implement their changes. The result of those changes was the impossible beast that we have come to know and fear as Sinistar now. While it is highly unlikely that Williams or the original programmers will ever release the less difficult version of Sinistar we can always wonder. Berzerk tells the timeless tale of one green man trying to navigate an electrified maze full of shooting, exploding robots. The gameplay is all about escaping to the other exit of the maze while racking up as many points as possible on the way out. The points that the player is awarded depend on the color of the robot killed. The different colors of the robots were used to indicate the level of difficulty and points awarded for each tier. For example, a green robot would fire 3 bullets, while a red robot would fire 5 fast bullets. This ensured that the player was always surrounded by quick death at all times, but also made you more likely to try and face the increasingly impossible odds head on; all in the pursuit of that elusive high score. In addition to the brutal level of difficulty presented in the enemies themselves, the player had the mazes to contend with. The game could generate a total of 876 unique mazes for you to have to face its myriad of enemies in, and it was made all the more complicated by a giant smiley face of death. This would be Evil Otto. Evil Otto was a bouncing smiley face that would appear and make the game speed up while he bounced around the maze. So if you’re keeping track, we’ve got; electrified maze walls; robots that shoot; robots that explode; robots that shoot and then explode; a giant smiley face of death that makes the game go faster. There is no way that this game, or any other game could be more difficult right? Did we mention that the game makes you stand still in order to shoot? Because it does. Maybe that’s why Berzerk was, and still is considered one of the hardest games of all time. Zaxxon was a game of many firsts when it was developed and released by Sega in 1982. The game was the first game to use the isometric perspective; it was the first game that had any type of shadow effects; and it was the first arcade game to be advertised on television. The gameplay is fairly simple, with the object of the game being to complete all the levels with the highest score possible. You of course achieve this, by blowing lots of stuff up without getting destroyed yourself, or running out of fuel. That’s right, you could run out of fuel on Zaxxon, and meet your untimely death that way. This is of course in addition to the numerous ships, turrets, missiles, and other hazards that are vying for your destruction at any given moment. Fuel can be replenished by blowing up fuel canisters though, and the player can control how high or low the ship goes to add more tactical maneuverability to the mix. Zaxxon is incredibly difficult by any standard, but many players found the isometric design of the game to be confusing with it’s particular color palette. This made it hard for some players to be able to differentiate, and accurately place the threats on the screen. Whether or not, the perspective is the main culprit, the fact remains that Zaxxon was without a doubt one of the toughest retro arcade games in existence. Gauntlet is probably the forefather of the four player arcade cabinet experience. At the time of it’s release in 1985 there were no other arcade cabinets that featured the four joystick setup that Gauntlet used. Players could pick from a Warrior, a Mage, and Elf, and a Valkyrie as their avatar to fight through the dense mazes of Gauntlet. Players have a basic “fire” button and a “magic” button that they can use to employ each different type of attack in order to defend themselves. Gauntlet was unique in that it allowed players to play procedurally and find items that would improve their characters for the duration of their life. This made Gauntlet extremely addicting for certain players, that would literally spend days in the arcades playing Gauntlet over and over just to see the different type of items they could find. Smash TV was another Williams arcade classic. The game features the same game mechanics as another Williams classic game; Robotron 2084. In both games, the player made us of two sticks simultaneously to control the character’s movement, and their shooting. The left stick would move the player, while the right stick controlled the direction of the players shots. While both games are difficult, Smash TV is easily the more difficult of the two. Featuring a host of vibrant levels packed with killer enemies, this game stacked the odds against you regularly. Smash TV did make smart use of power ups, and smart level design to keep players engaged, but it was the promise of completing the spanning opus that kept most people pumping coins into the machines. For the most part, players would never see the final showdown of the game. While the power ups would give you access to much more powerful weapons that could deal out serious damages to enemies; those power ups were short lived, and wore off quickly. This left you with a basic machine gun that did little damage, and didn’t do much more than annoy your opponents. This is made much more complex by the fact that for the majority of the game your opponents are unholy death machines that spew enough ordinance to take up the majority of the screen real estate. Unless you had the right set of power ups at the right time, and combined that with lightning quick reflexes, you were going to die in a number of horrible, and violent ways. Well there you have it. 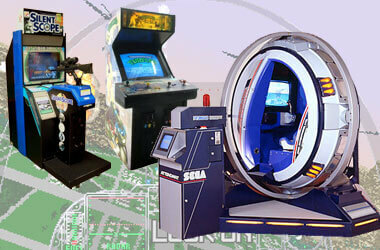 We hope you enjoyed reading about the 5 of the most impossible arcade games of all time. If you’re the adventurous type, maybe you should try to seek out an arcade that has one of these remorseless machines inside it. Test your skill, and see if these really are that tough, or if the stories are just exaggerations. Who knows, you might be surprised to find that you’re an old school arcade champion and didn’t even know it! Of course if you have a score to settle then we have the machines to give you that chance. Our Frontier Customisable arcade comes with Sinistar, Gauntlet & Smash TV out of the box, with Zaxxon and Berzerk as optional add-ons. While our Galaxy 2 (cocktail) and Cosmic 2 (upright) arcades both come with Zaxxon. Of course if you need any further advice on these or any of our other awesome arcades just give one of our sales advisers a call free on 0800 612 8180.